Art is gaining ground here on Raleigh Nature, as perhaps it well should. 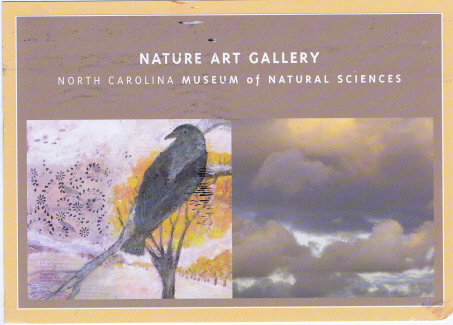 Last summer, I posted about art shows related to Raleigh nature, and now I’m really enjoying participating in a piece of correspondence art, or at least communication art, by Julie Thomson, an artist and a scholar I met at the Black Mountain College conference last October. Still haven’t written about that event over at Raleigh Rambles, but I had to share this wonderful project. Julie’s installation consists of a poster about her piece inviting people to chalk “Do You Hear Birds?” in places they heard them, with a large pile of beautifully printed and wrapped chalks for people to pick up. Her blog documents responses. The piece is part of a show called “Local Histories.” Saturday, March 5, Julie is conducting a bird walk in association with her installation. 523 E. Franklin Street, Chapel Hill. Closer to home, Lee Moore’s show about birds opens Friday, March 4 at the Museum of Natural Sciences Nature Art Gallery. Lee is a dear friend, a Bain artist who got me involved in that project, and a wonderful artist whose bird art was shown in the last couple of years at the Cameron Village Library. She’s also the person who first informed me of the presence of coyotes inside Raleigh – Boylan Heights, specifically. personal bird encounters in collage paintings, photography and recordings. treescapes that create an environment for Attracting Birds. As if these shows weren’t enough synergistic art for Triangle birds, Adam Peele has a show entitled Raleigh Is For The Birds at Design Box. 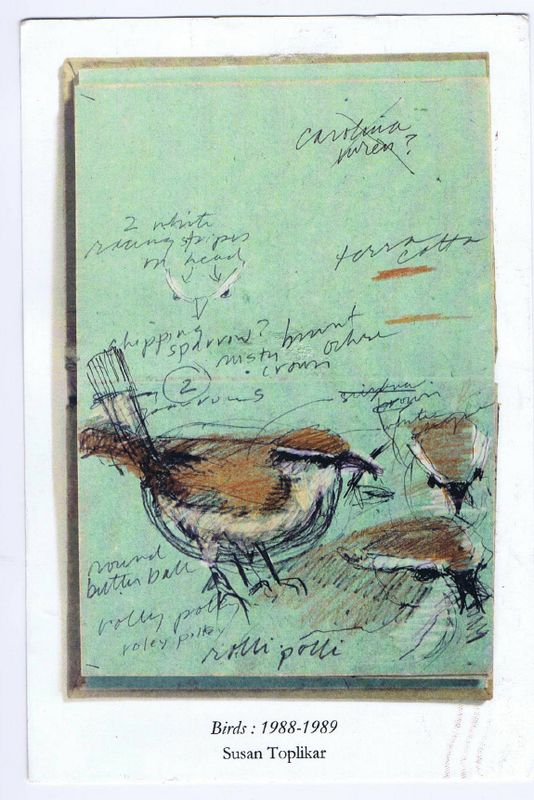 I also have to add this lovely image from an older bird show – Susan Toplikar’s show in 2008, based on notebooks of bird sketches she created while medically homebound. Birds have a presence that enters our lives: we take them for granted and yet we do observe and react to them, and they frame the audial background of our day in ways we hardly realize. 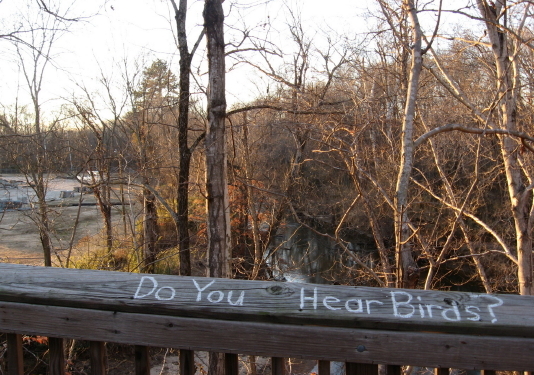 Do you hear birds? 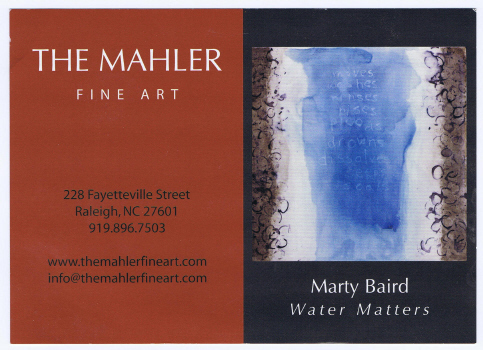 Marty Baird's show at The Mahler documents experiences of NC waters. A personal post as I approach a new era of the blog: moving it toward my book, The Natural History of Raleigh, and recovering from the sabbatical of sorts imposed by other interests, my school year and most of all Meniere’s Disease, which is a non-lethal but incurable inner ear condition which has hampered all my work for the past year. As I have learned to manage my disease and its triggers, I have also become fully engrossed in work related to Raleigh Nature but not what I want on the blog: urban agriculture and the movement toward local sustainable farming in the area. I’m posting about that work at Pecans and Mistletoe, a project blog which has taken on a life of his own. Severely limited in screen time many days, I can always find relief from my tinnitus and relaxing pleasure in tending our garden, which we have converted to mixed herb, flower, and food crops. And our new chickens have lifted the gardening into a whole new level. It was a challenging school year, and now that summer is here I will try again to make more time for this blog. Paintings and drawings that document artist Marty Baird’s experience of the waters in several North Carolina Rivers and the Atlantic and Pacific Oceans. A percentage of sales during the exhibition will be donated to Triangle Land Conservancy, a non-profit that protects important stream corridors, wildlife habitat and natural areas in North Carolina. Marty’s work in the show varies widely, but all the pieces display the action of gravity on liquids as they encounter the paper. The piece at the top of the post is one of the most successful of her painted word lists, which evoke names for water and wetland features. Much of the other work is literally water and gravity – deftly defined ink lines of water volumes, delicate featherings of outblown tributaries, patterns of action taken from flowing water. The benefit to Triangle Land Conservancy will help protect stream corridors and riparian wildlife. Be sure to check it out. Hannah Costner has done a great job taking over Sarah Blackmon’s gig curating The Block Gallery in the municipal building downtown. The current show combines two completely different artists, whose work nevertheless makes a complete show that works well. Anna Podris has shown her whimsical encaustics all over town, and I love them every time I see them. Fantastic creatures and pure nature animate every one of her paintings. As she says, each piece creates its own world. Gene Furr’s nature photographs reflect his journalist background – superb documentation of natural scenes and animals with over-the-top spectacular settings, lighting and details. This show continues Block Gallery’s stellar offerings of recent years, as well as its fine tradition of providing a venue for cutting edge video, dance, and music at its openings. Luke Buchanan offers intriguing and nostalgic cityscapes at Rebus Works. 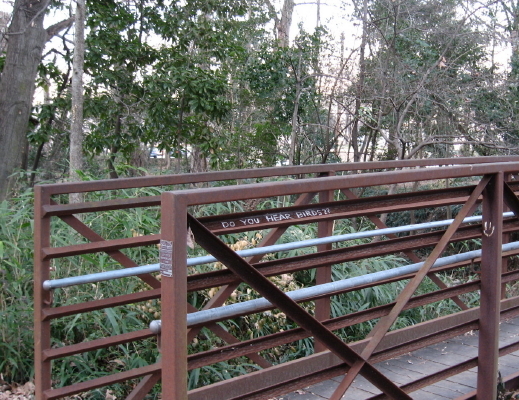 Nature is what you make of it and Luke Buchanan explores what people have made of Raleigh. His show at Rebus Works by the Boylan Ave. Bridge are large, even powerful painterly treatments of classic Raleigh street scenes. Everything from Cup-o-Joe’s to Hayes Barton comes to life in highly recognizable images which still yield to well used artistic license. The postcard image above is actually from the related group of drawings at Stitch on Hargett Street, which has been the venue for several “sideshows” out of Rebus, but here gets a lion’s share of the show with a dozen really nice drawings (many already sold) with the same themes as above. Luke’s work does what I want this blog to do : wake up and pay attention to the wonderful Raleigh around you. I will never have the time I’d like for this blog and it’s eventual book project, anyway not until I retire from teaching in 5 years. I hope the book is out by then. I’m still caught up in Black Mountain College and Ray Johnson work over at Raleigh Rambles, and I now have a new daily item: my page on Facebook. 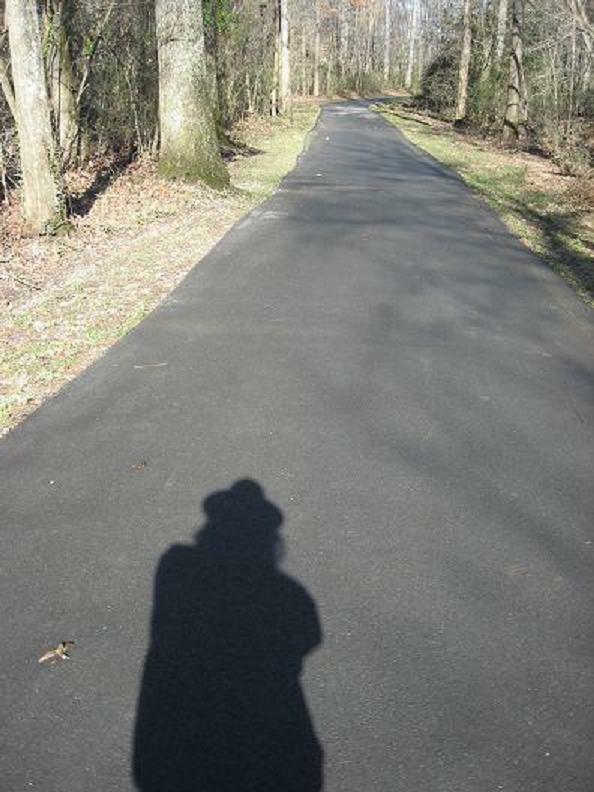 But I’m looking forward to posting a lot soon here – if it will cool off enough to get outside!! Peace to all. Get outside – and if it’s too hot, then go see some art!